writes a weekly news release. The most recent article is shown below. If there is anyone who considers a field trip f or students as strictly a way of getting out of the regular classroom work, they would have that myth dispelled by going into one of the THOMPSON-AMES museums sometime as an observer. That most of the kids find it a fun activity is true, but it is also a learning experience impossible to duplicate in the more formal classroom setting. When the students come into the Homestead Room, it's easy to realize that the teachers have set the stage well by giving them some background knowledge of the period. Sometimes they enter with some diffidence that is quickly dispelled when they observe circumstances vastly different from those in their own homes. Even the most shy among them open up and ask questions as they compare what they are looking at to their own homes. For example, I might ask them how they feel when their parents get after them to "please hang your clothes neatly in the closet." Do you think the children of 150 years had that problem? Where did they hang their clothes?" Their eyes dart around the room, and at first they appear a bit befuddled to find the room totally lacking a closet. Their eyes open really wide when they realize that the six pegs in the wall were actually used to accommodate all the clothing for the whole family. There generally follows a discussion then about the disparity between the amount of clothing owned by the children of that era as compared to our own perceived "needs" as to what constitutes an adequate wardrobe. Samples of clothing of that time are shown to them--the skirts and aprons the women were apt to wear. The girls are especially enthralled with the “mob caps" or “mop-caps", the high frilly caps which the women and girls used to tie under their chins. Then the question arises, were they called that because the caps were used to cover their “mop" of hair? Sounds pretty likely, don't you think? 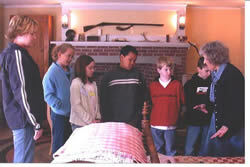 The children are encouraged to ask questions, and everyone takes part. When one child in the group has had the benefit of having been in the Homestead Room previously, that child finds great satisfaction in explaining to the others some of those issues. A child who might experience difficulties asking a question in class because they are afraid of appearing stupid, has no hesitation in speaking up in the accepting atmosphere of the museums. The Thompson-Ames Historical Society of Gilford with its fine collection of living museum pieces provides a unique opportunity for all of us to learn more about Americana from a by-gone era. The timing couldn't be better because in recent years it seems there is almost an explosion of people interested in exploring their roots.